Joffs All Sports Bar - The refugee crisis..??!! Solution : oh here ye refugee, try abandoning your religion forever, cast away ye old dark ages ideas and leave your cult for freedom, reward will be to live in peace as intelligent normal folk in a secular society where progressive ideas and science reins. At a certain point you have to stand and fight for your country not run off to someone elses. Does any even know what the Long war is about anymore..?? You don't like fiddles' self-admitted simplistic view ? I think fiddles believes religion causes haemorrhoids as well. Why is everybody in that area so freakin' useless militarily except for the religious nutters? The Iraqis and Afghans have had enough training and hardware given to them to win 3 world wars, far more training and hardware than the nutters, but they can't fight their way out of a brown paper bag. Saudi has 1 of the worst human rights violation on record,yet nothing,zilch,who cares attitude from the worlds so called peace keepers. That's an asylum seeker. A refugee is in real fear of their life. May seem cold hearted to distinguish, but it's important in terms of different nations' policies etc. with all that bending over, it doesn't help.. So what's the reason for the war over there then...?? "Someone should show them how to turn the boats around!" If that is so, it is not only he that is shameless, but the MP's that keep him as PM. I am not sure Bill Shorten is really much better, though. Mr Abbott said on Friday: "If you want to stop the deaths, if you want to stop the drownings you have got to stop the boats. "We saw yesterday on our screens a very sad, poignant image of children tragically dead at sea in illegal migration," Mr Abbott told ABC radio. "Thankfully, we have stopped that in Australia because we have stopped the illegal boats. "If you want to keep people safe, you have got to stop illegal migration and that's what we have done." "SAD, POIGNANT IMAGE OF CHILDREN TRAGICALLY DEAD..."
Alternate simplistic view: Continue to relocate & absorb all refugees untill each of these warmongering countries/warlords & ISIS have only each other left to kill. These wars have prevailed for thousands of years but now, civilians realise they have some semblance of a chance of a better life in an alternate country. jujono - u speak so much sense. I prefer the Libs but his/party view has DISGUSTED me. Abbott is a sheep of hit, and it is not a recent discovery on my part. Simply could not vote for the Libs with him in the side, let alone on top. It frightens me that he is still PM, shows how thin the ranks of possible leaders are. Just pointing out the distinction, Fiddles. Frankly, there ARE many people who take the path of what Abbott disgustingly (in this case) called "illegal migration" - they can not be legally classified as "refugees" because there is no direct threat to their life. To make it worse, they often deliberately come without any papers etc, knowing that if they land, they will at least be able to stay until it is proven that they don't fall under refugee status. That's why "stop the boats" is a policy. A nation that has signed up to international "law" agreements "must" take in refugees, but is entitled to regard illegal immigrant asylum seekers as law breakers who clog up the system. Not saying I agree with it, but that's the reality. I studied this stuff and did volunteer work with refugees, and the simplistic ideas that get thrown around are pretty far off reality. Oops and just realized Fiddles wasn't referring to my distinction at all - thought he was responding to my response to the post he responded to! Stopping the boats doesn't stop the deaths, they just die somewhere else. That was the advertising pitch for Ratsak, " they go away to die." And some people do regard these desperate people as rats. The Germans seem intent on rectifying some of the sins of the past with a more humanitarian attitude. I've said it before and I'll say it again. What goes around comes around. Make no mistake about it. One day Australia will have people fleeing here as refugees. It might be in 10 years time .... it might be in 100 years time. It will happen and when it does I would love to be around to see the reaction of those that demonise and refuse entry to refugees today. Actually it's the horrible people who run these boats who are responsible for their deaths. They are callous people who deal in stuff most people don't want to know about. Whatever you think of the Assad regime, Syria is a secular state, they have progressive modern views compared to most of their neighbors and religion isn't a factor in daily life. They were considered lower middle income by world standards before this war. These refugees all carry iphones and laptops. They are escaping a prehistoric closed minded group trying to take that from them and the west who are promoting a civil war in their country. What are they supposed to do? You say they should go to Saudi Arabia? A country that is still in the dark ages and everything Syria is transitioning out of. SA also have a war of their own they are dealing with on their border Why would people cross through other countries to get there? The fact is that approx 4 million people have crossed borders to wait with their immediate neighbors till things settle down, if they ever do. Just like Europe in the 30's a number of people don't see things getting better and look for a better place to relocate their families. Who can blame them. Very easy to be critical on this issue...much harder to put up acceptable alternatives. If we want an open border policy to help everyone else around the world...fine...however kiss good bye your current standard of living. Must have an impact...both financially & culturally. Plenty of suburbs in Sydney paying the penalty of poor cultural assimilation let me tell you. We should at least probably double our intake due to current global problems...question is will it ever get any better...just seems to move around from hotspot to hotspot. Will this be deemed "good enough" by those currently critical ?...I doubt it. The need will "always" be there to take more...& any argument against it will always look poor when the reality of a kid drowning at sea sea is put up. As for Shortens mob being critical of Abbott....deary me. What an absolute abomination of a performance they put in...short memories obviously...best just shut up on this issue ! Current estimates of global "displaced people" is in excess of 50 million...a figure that is growing rapidly day by day. Should Australia take all these people ? Obviously not...so what is an acceptable figure ? You will never get a number out of the bleeding hearts for their generosity is boundless. But I propose a figure of 20 million- 20 million Muslims- that will make us all feel virtuous. I'll leave it to your children to deal with the consequences. That's interesting Hollywood, just what do you see as the cause of this exactly..?? Couple of things here, I never said they should go to Saudi, that would be the last place they should go, that place is a hell hole, and secondly Syria might well be a secular state by design but it's people are all mainly muslim, I see they all carry iphones and have nice hair and clothes and makeup etc, that really has nothing to do with this imo, my point is I always go back to the root core of these infinite problems, all these wars and conflicts are started with religious arguing back hundreds of years ago, it's been so long now that no one even remembers this..
What kind of a freakingly ignorant comment is this?? What a surprise. You have somehow managed to make the issue about your standard of living......could you be any more selfish?? Can you explain how this conflict relates to religion? You don't know our fiddles very well, there is no evil under the sun that cannot be traced back to religion, he thinks. If only it was that simple. In reality, it is civil wars that produce most of the refugees, and unfortunately foreign countries interfering in civil wars does not seem to have helped any. Yes Gay......unlike some others on here.....one fellow in particular....we actually care about this place ! there are others, but most have been about or born from differences in religious beliefs..
Ha, in other words, I have a great life, stuff everyone else. It's their fault they were born in Syria and not Australia. Please explain how the 216 refugees we have currently taken in from Syria will impact your life Gay? On this, you are implying that refugees are incapable of being anything other than mooches on our society and welfare system. Is that fair? Lot of things in life are "not fair" Subby...you of all people should realise that. You are correct Subby...in isolation the 216 have probably had very little impact. However, we have taken a lot of refugees from this troubled area over the last 20 years or so. For example, 80,000 plus from Iraq. In broad brush terms, our population is growing at 2% per year...with less than 50% of this being the result from natural growth. The other 50% plus is from net migration. So over the last 10 years alone we have increased our population with a ball park increase of 4 million people...of which over half is due to net migration...many of which would require substantial assistance. My point being this must be having an impact on our standard of living. I am not suggesting we do not continue...or even increase it...I am merely pointing it out that it does come at a financial cost to all of us.. The cultural impact is another whole story. This is why Hungarian Prime Minister Viktor Orban doesnt want them. I also learnt today that he was simply abiding by the Schengen Agreement, so my thread shaming Hungary was completely wrong. How are these European countries going to cope with huge intakes of 5 a day muslims as far as jobs go..?? they are already under huge unemployment strains with some places reaching nearly 50%..
And look at Russia, already in Syria to commit mass genocide. Somebody wants Syrian real estate. I wonder which nearby nation wants Syrian real estate? What's most ridiculous about this apart from ISIS being a band of religious nut bags is that they number so small yet are so powerful they can move entire nations by foot to move to one place to another just by fear... the best way to beat those sick lot is to penetrate from the inside, never in a million years will they beat them from the outer, they are like onion weed.. Funny how Isis is apparently destroying Muslim monuments in Syria ?? Fiddles, we are being had. Russia is inside Syria, allied with a nearby nation I wont name, and committing genocide in Syria, and Muslim Syrians are scampering to Europe. Strange that, I thought Isis were Muslims? Why are the refugees predominately Muslims?? Oh, massive Muslim prayer services in Budapest. Huh?? Isis wants them out of Syria???? Huh?? Maybe someone else wants them out of Syria. Mmmmmmm, wonder who. Because ISIS is fractionally splitting the religion to make enemies out of other muslims by calling out text in the koran claiming other muslims are wrong, correct me if I'm wrong but ISIS are claiming gelatie Muslim text as the true word of God and anyone who is not in agreeance, (other muslims included) is rewarded with death...in other words idiots with bibles and korans still trying to interpret dark ages nonsense in 2015..
LMOA..the swear filter changed S H I T E to gelatie...!! I don't know about anything there that anyone wants except the usual oil or gems etc, but that whole region you may as well put a huge red line through it, because of it's ancient dark ages ties to religion in that area it is forever lost to conflict and war... for as long as people cling onto those ridiculous notions the area is lost to conflict FOREVER..
can you ever imagine a series of Observatories or Scientific based communities and organizations popping up in that area, no the best thing now is to contain all the idiots there and put a huge barbed wire fence around those who have a make believe friend they call God and call it a day..
Fiddles is possessed by Satan, imo. You have an amazing sense of entitlement for an immigrant. let us step one step, what jobs would these people not slot into and why..?? What sort of jobs do you have in mind for these people, fiddles ? what a pointless question, you are the one stating they wouldn't slot into jobs, how about you tell us what the jobs they wouldn't slot into are..?? All I said was there is plenty of work here that's not an issue, it's generic...there are job vacancies everywhere in Australia for all sorts of work.. I am saying they would be difficult to place in work, in most cases, and you are wrong to think there is plenty of work available generally, right now. So again, what are these jobs for people who probably speak little or no English, as well. There is bound to be a back-lash in Europe if the flood of immigrants continues, once you create the idea that there is an open door, many more will want to come. They can't take a continuing influx that has no end to it. The Abbott Government wants to restrict any intake of Syrian refugees to minorities which are largely Christian, as passions run high in the Coalition over the way Australia should handle the crisis in Syria. Prime Minister Tony Abbott is http://www.abc.net.au/news/2015-09-08/baird-open-to-accepting-more-than-10000-syrian-refugees/6756744" rel="nofollow - under increasing pressure to increase this year's humanitarian intake of 13,750 people , but has put off a decision while further international consultations are conducted. Labor is pushing for an additional intake of 10,000 people, while the Greens want double that number. Beyond the debate over numbers there is an argument over what kind of refugees should be accepted. 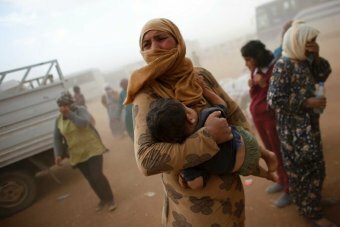 Government ministers, like Malcolm Turnbull, have argued for accepting more Syrian Christians, and Foreign Minister Julie Bishop has nominated minorities like the Yazidis. One backbencher told the ABC the message being sent to the Prime Minister by some in the Coalition was clear: "No more Muslim men". Mr Turnbull said yesterday he was very concerned about the plight of Christian communities in Syria. "They are a minority, they survived in Syria, they've been there for thousands of years, literally since the time of Christ," he said. "But in an increasingly sectarian Middle East, you have to ask whether the, the gaps, the spaces that they were able to live and survive in will any longer be available." Ms Bishop told AM the Government was looking at the best way to offer both temporary and permanent protection options for those fleeing the crisis. "I think that Christian minorities are being persecuted in Syria and even if the conflict were over they would still be persecuted," she said. "So I believe there will be a focus on ensuring we can get access to those persecuted ethnic and religious minorities who will have no home to return to even when the conflict is over. "That includes Maronites, it includes Yazidis, there are Druzes, there are a whole range of ethnic and religious minorities that make up the populations in both Syria and Iraq. "We'll be focusing our attention particularly on the families who are in the refugee camps along the border of Lebanon, Jordan, Turkey." Yesterday in the Senate Liberal backbencher Cory Bernardi said persecuted minorities must be the focus on Australia's efforts. "The Christians in the Middle East are among the most persecuted people on Earth," he told the Senate. "If we can provide safe haven to them, then I say we should do it. And that is what the Prime Minister has said." Senator Bernardi also questioned the motivation of thousands of those who are trying to enter Europe. "This seems to me to be becoming an opportunistic cycle which is masking the true humanitarian need that is the responsibility of all Western nations," he said. "That is the challenge for us - to distinguish between those who are being opportunistic and those are truly in need." Government backbencher Ewen Jones said Australia had the capacity to take up to 50,000 refugees. But the calls for ever larger intakes were rebuffed by another Coalition backbencher, Andrew Nikolic. "We will do this is an evidence-based way," he said. "We're not going to do it in a way with this rhetoric of trying to out-compassion each other." Opposition Leader Bill Shorten has cautioned against singling out particular groups for refugee places. "But if you're a woman facing terrible crimes to be committed against you, if you're a child, a little child, potentially drowning at sea, I'm not interested in their religion, I'm interested in their safety." Persecuted minorities in Syria should get first stab at gaining refugee status = that would mean any Atheists..?